I don’t have anything against Hallmark. Or Valentine’s Day. But what irks me is this: when we’re fed ideas about these “picture perfect” lives that for most people simply don’t exist. Our culture tends to lure us into specific ideas about what our lives should look like. Those shiny heart-shaped boxes of chocolates, the perfect red roses, and the even-shinier and rosier laughing faces of lovers at an expensive restaurant can be a set-up for deep disappointment, loneliness, and regret. If you’ve got that Hallmark card kinda life, great! I’d almost say there’s no need to read on. But that’s not true. Because even if you do have a life that looks like that, I dare risk it to say, that there’s still something much better waiting for you this Valentine’s Day. And it doesn’t come in a box — heart-shaped or otherwise. And if you don’t have that Hallmark kinda life, join the crowd. Most of us don’t have lives that look like catalogues and commercials. But you know what? Even if our lives don’t look like that, they can feel like we’ve always imagined. What if Valentine’s Day weren’t about jewelry and chocolate and hearts and lovers? What if, *gasp*, it were simply about love? What if we chose to make it about love? Of all shapes and sizes. 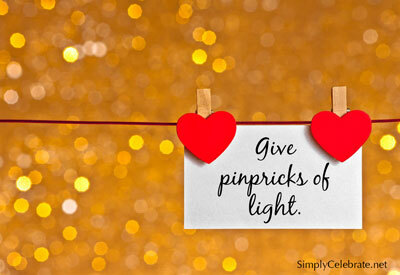 What if each of us set out on our own small personal mission to create a few pinpricks of light for people in our lives this Valentine’s Day? Sure, one of those people can be someone we romantically love. But what if we included our family, our co-workers, and people we never met? Consider reaching out to everyone in your life whom you want to express your love to — wish them all a happy Valentine’s Day. But also, give some special thought to anyone who might be lonely, sad, or grieving on this Hallmark holiday. Can you offer an extra boost of love to anyone who may be feeling left out this week? Poet Rosemerry Trommer and I have teamed up to offer a 7-Day Challenge. 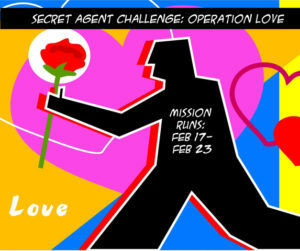 It’s called Secret Agents of Change Challenge: Operation Love. Your Valentine’s gift to yourself and the world could be your commitment to participate! Every day we will give you a poem and a prompt. You go out into the world to perform your secret kindness challenge and then report back. Easy Peasy. Here’s the link to join the Facebook Group, where it all starts on Sunday, February 15th!